Nearly 50 former NASA scientists, astronauts and technologists are chastising NASA for its position on man-made climate change. “As former NASA employees, we feel that NASA’s advocacy of an extreme position, prior to a thorough study of the possible overwhelming impact of natural climate drivers is inappropriate,” the letter reads. “The unbridled advocacy of CO2 being the major cause of climate change is unbecoming of NASA’s history of making an objective assessment of all available scientific data prior to making decisions or public statements,” the letter reads. NASA spokesman Steve Cole told The Daily Caller that they have not received the letter yet. “We are now aware of the correspondence but have not yet had an opportunity to review the contents,” he said. The group, according to a news release, includes seven Apollo astronauts and two former directors of NASA’s Johnson Space Center in Houston. The letter surfaced Tuesday on the blog Watts Up With That? “Our concerns are about the reputation for NASA,” former Apollo 7 astronaut Walter Cunningham told The DC in an interview. 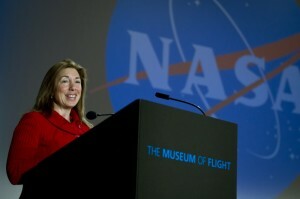 Cunningham explained that the co-signers came together through the NASA Alumni League’s Johnson Space Center Chapter in Houston. Steward said the group is just a loose coalition of former NASA employees who agree on the topic and said they aren’t being funded by anybody. “They don’t have a penny,” Steward said with a laugh.